Russia has rescinded its long-standing ban on the export of black caviar to Europe due to recent successes in cultivating sturgeon on fish farms. In February, Russia lifted its nine-year-old ban on caviar exports to Europe. The ban went into effect in 2002 as part of a campaign to combat overfishing and poaching of sturgeon in the Caspian and Azov Seas. The lifting of the ban indicates that Russia’s attempts to improve the situation, which include an aggressive aquaculture campaign and increased crackdowns on illegal fishing, have been successful. Caspian and Azov sturgeon were once the main source of black caviar on the world market. With the fall of the Soviet Union, however, the caviar business became dominated by poachers, and the sturgeon was almost completely decimated. Statistics from WWF Russia show that in 2010, the sturgeon population was one-fortieth what it had been in the late 1980s. In 2002, Russia imposed a blanket ban on the export of black caviar, and a year later, on commercial sturgeon fishing. But the main avenue for legalizing illegally procured caviar remained open: All confiscated caviar could be sold at retail prices. That loophole was closed in 2007 when the government ordered all caviar confiscated from poachers to be destroyed. In 2009, fishing for sturgeon in the Caspian Sea even for “scientific purposes” was outlawed. As a result, the sale of contraband caviar has fallen dramatically, according to Roman Andreyev, an analyst at the investment company Alemar. The only caviar available for purchase legally today is from fish raised on farms. Russia began some time ago to artificially cultivate the coveted fish, but as it takes seven years to raise a sturgeon, results of the campaign are only now being seen. In 2009, Russian fish farms produced around 2.6 tons of black caviar. Andreyev estimates that today these farms produce three times as much: from 6 to 7 tons. According to Andreyev, three fish farms set up 20 years ago are now working at full capacity. In the next few years, five or six similar farms will begin to yield results in caviar production. Producers of farm-raised sturgeon say that the taste of their caviar is every bit as good as that from wild sturgeon. Over the next five years, Russian fish farms are expected to increase deliveries of caviar to both the domestic and foreign markets. 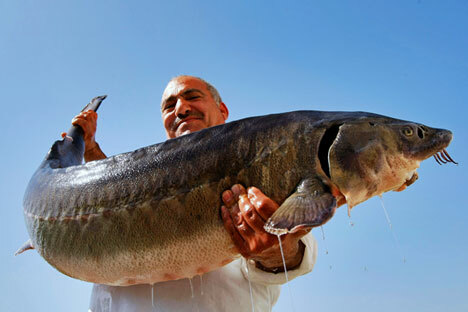 At the moment, however, farmed sturgeon cannot entirely satisfy the demand for caviar. Russia’s official fishing agency, Rosrybolovstvo, allowed to export 150 kilos of black caviar to Europe annually. This is a paltry amount compared with the 1,500 tons annually the Soviet Union supplied to Europe every year. Roman Andreyev said that in recent years, Russia officially produced some 15 tons of black caviar annually, but sold up to 300 tons. The difference between supply and demand is made up of contraband caviar from wild sturgeon. And so, the motivation for illegal fishing remains high. Even taking into account the bribes paid to conservationists, bureaucrats and distributors, the cost of producing one kilogram of Caspian black caviar is under $50, said Andreyev, while in markets and restaurants, it costs from $1,500 to $3,000. Local authorities on the Amur River set quotas for themselves and procure caviar for supposedly scientific purposes, when in fact these are commercial hauls, said WWF Russia’s Alexei Vaisman. In Russia’s Far East illegally obtained caviar is openly canned in local factories. A WWF representative described this problem as “sweet, naïve, provincial gangsterism.” The income from illegal caviar sales is estimated at around $1 billion. In Europe, Iranian caviar had been filling the gap left by a lack of the Russian variety, but according to an agreement among countries that border the Caspian Sea (Russia, Kazakhstan, Turkmenistan, Azerbaijan and Iran), any of these states wishing to increase exports of black caviar must have the agreement of the other four. Russia has always voted against any requests, hoping local industry would recover to the point it could reclaim the lost market share. Now, maybe, the time has come. However, legal Russian black caviar has yet to arrive in Europe. The problem, according to Arkady Novikov, the owner of Russia Caviar House, is that the European Union enforces technical regulations on aquacultured products, including caviar from farm-raised sturgeon. Russia has not yet signed a document assuring the regulation of the production of caviar from fish farms. “But without it, not one Russian company can supply such caviar, and Europe won’t accept it,” said Novikov. Now that the ban on the export of black caviar has been lifted, there is motivation for such a document to be signed. Until then, individuals can take caviar from farm-raised sturgeon out of Russia as long as they have a packet of documents, including permission from the Ministry of Economic Development and the international organization CITES, which supervises trade in seafood products. Alternatively, it is possible to buy black caviar from farm-raised sturgeon without permission at the duty free shops in Moscow airports.